In January 2019, CG&A COMMUNICATIONS celebrated its 25th birthday. To commemorate the occasion Chris George reflects on the company’s development. This is the second installment of a five -part series that chronicles the growth of the company at the Turn of the Century. As the clock struck twelve to mark the beginning of the 21st Century, residents of our country’s Capital were also celebrating the birth of a new city. A total of 12 municipalities and 150 communities came together that evening to become the new City of Ottawa – spanning 2,760 square kilometres and boasting 800,000 citizens. The momentous task of amalgamating the region was given to a board of seven individuals, led by one of Ottawa’s preeminent residents – Claude Bennett. The Ottawa Transition Board’s (OTB) 14-month mission was to establish a new council and city management team; design new delivery models for municipal services; re-organize the municipal 14,000-plus employees; and, present budgetary recommendations to save taxpayers over $80 million annually. Chris George was named communications counsel to the Chairman, and to the Board’s Members and its staff. CG&A COMMUNICATIONS’ network of consultants was given the task of managing the Board’s full array of public relations initiatives. For all of us involved in the OTB’s challenges that year, it was a distinct privilege to work with Claude Bennett and Board Members Camille Guilbault, Ed Mulkins, David Muir, Pierre Tessier, Al Bouwers and Kathy Greiner. The years 1999 and 2000 will remain an unforgettable time for CG&A COMM and our OTB team! For CG&A COMMUNICATIONS’ core consultants, it was wonderful to work alongside Susan Wright and Gilles Verret. These two individuals are very talented at plying their trade and they were instrumental in implementing effective employee and issue-specific initiatives. There were other talents who were integral to the OTB Communications Team, whose efforts contributed greatly to the success of the public relations program. Stephanie Machel managed the office, Carl Martin oversaw media relations and Andrée Paige worked on community outreach initiatives. Thank you to all! The years following the OTB were very productive at CG&A COMMUNICATIONS. We were heavily involved with MADD Canada’s government advocacy and media relations efforts as that organization grew in stature and established itself at the forefront of the anti-impaired driving battles in our country. 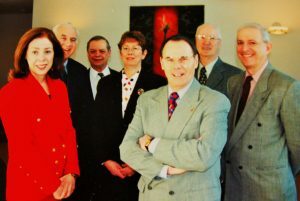 In 2000, CG&A COMMUNICATIONS became the public relations company of record for Hydro Ottawa and, then later, serviced its sister companies, Energy Ottawa and Telecom Ottawa. With Hydro Ottawa, we counseled its CEO and senior management team on communications issues, helped establish its corporate brand, and assisted with the implementation of both its internal and external communications programs. The Hydro Ottawa contract provided the opportunity Andrée Paige to sign on as a lead consultant of CG&A COMMUNICATIONS. In the wake of the OTB, there was no other event that had more of an impact on the firm’s lasting presence in Ottawa than Andrée joining our core team. Andrée’s conscientious and efficient management of projects was a real asset for both the clients and our company’s reputation. Her ‘left-brain’ insight and enthusiastic approach to her tasks made her someone you want in your corner. It was a treat to have Andrée along on the CG&A COMMUNICATIONS journey! CG&A COMMUNICATIONS expanded their roles within Hydro Ottawa, CMEC Copyright Consortium, and MADD Canada. The company’s braintrust grew not only in numbers but, more importantly, in its capabilities. The strength of the team lay in the skills and professionalism of the core consultants: wordsmith Andrée Paige, creative designer Raymond Leveille, webmaster Fraser Anderson, and translators Julie Baker and (subsequently) Johanne Ladner. Similarly, through those years CG&A COMMUNICATIONS developed an excellent network of associates and partnering companies to help service its clients. We are proud to have had affiliations with Nik Nanos, Nathan Rudyk, Barry Solway and Vicki Griffiths. President Chris George attributes the success of the company on continually building the consultancy’s network and its partners. With one foot planted in corporate and not-for-profit advocacy and another planted in government affairs at all levels, CG&A COMMUNICATIONS evolved into one of the leading independent public relations firms in the Nation’s Capital. Having passed a number of satisfying milestones in Ottawa, the company’s founders decided to strike out on another course. In the summer of 2002, Chris and Lisa George pulled up stakes and moved their home and office across Ontario to Niagara. Leaving a core team of consultants to service Ottawa-based clients, the Georges looked to extend its company’s reach into the GTA and the Niagara Region.